Adding to their already-significant holdings and resources, the Libraries have made available to UM faculty, students, and staff live web editions of two of today’s highly circulated news publications. Today’s libraries offer much more than spaces for quiet study or shelves lined with volumes of books, journals, and materials for research. In the digital age, libraries continue expanding beyond their physical walls, with the goal of providing access to information. 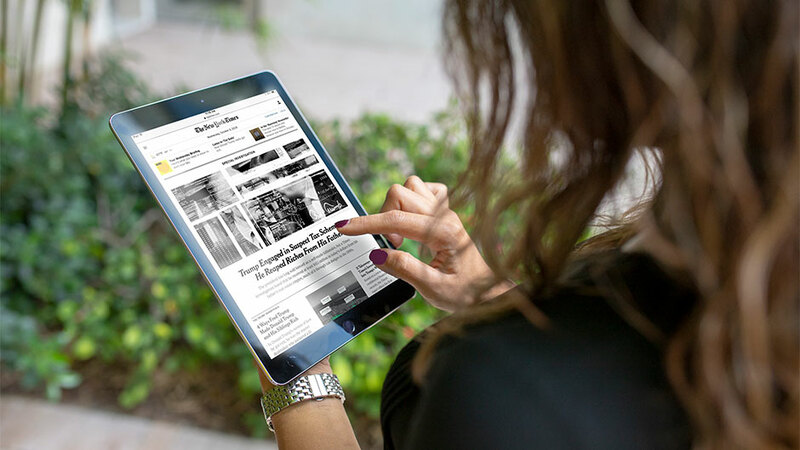 One such expansion can be seen at the UM Libraries where students, faculty, and staff are now able to access live web editions of both the New York Times and the Wall Street Journal at any time, across any platform or mobile device. Ready to get started? Just follow a few quick steps to create an online account and voilà—you’re in. To register for access, visit the Libraries’ News and Newspapers page. There you’ll find links to both New York Times Digital Edition and Wall Street Journal Online. Simply click each link and you’ll be prompted to create an account on each site to gain immediate access to their online content. Whether you’re a journalism student, economics professor, physician, or you work behind the scenes at one of UM’s satellite UHealth clinics, you can find something of interest—from financial market news to politics, to arts and culture and sports coverage—in the vast amount of information published every day, now at your fingertips. The Libraries provide access to more than 115,000 electronic journals and news sources, including the Miami Herald, Chronicle of Higher Education, and others. You can search for and discover these resources and more at library.miami.edu. If you have questions regarding access to any online source, just ask a librarian.